Brief Synopsis – While his wife and kids are away, an architect is visited by two mysterious women who seemingly got lost on their way to a party. My Take on it – I can’t even explain why I even thought for a second that this movie might be interesting. The plot is too extreme and I still question more than 24 hours after having watched it, what everyone was thinking when they decided to make this movie. 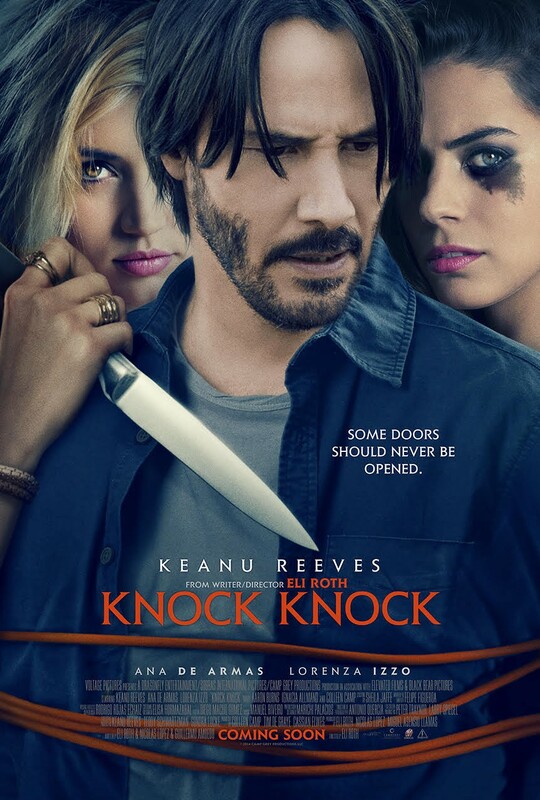 Keanu Reeves seems extremely miscast and out of his comfort zone in this film. The premise starts off ok, but too quickly goes into very strange and extreme territory. This movie seems to be a revenge film, but it is missing the slightly important factor of the explanation of the reasoning for wanting that specific revenge on him in particular. Bottom Line – Not the best thriller around and I’m still trying to figure out why this was made. Reeves feels very out of place here and I can truly say that this very very far from being his best work. Premise starts off interesting but goes places that get too extreme. Feels like it should be a revenge flick, but they forgot to add the why seek revenge into it. Totally agree . . . Imagine it being reversed and being two men with a woman, that would not have been allowed for so many different reasons! As a woman that massively annoys me. I “liked” the dark comedy in the ending. And isn’t Evan punished enough when his wife gets home. Haha. The big problem I saw was the actual murder that occured. Security ams would provide all proof necessary to authorities. A bad movie, but as Caz stated, memorably bad! Reeves bit about pizza and how his facial reactions were at the end had be dying in laughter! I think this can be a cult classic. Good review, Rob. I actually enjoyed this movie. Maybe I’m the only one. Hehe. I think Roth should have embellished the girls’ motives a bit more. Here is what I was thinking while watching. For me, they picked Evan for a reason. They think all men are susceptible. All men. They think the family man who pretends to be a monster, really is one. They try and pull it out of him. It’s really haunting. The blonde gave clues that she honestly wants him to be her “Daddy”. He is a good guy afterall, who just couldn’t turn down some “free pizza”. Really, for me, this movie just needed to be thrilling. And it definitely was. Your take on it made me snort. Thanks for saving me from this. Eli Roth – bless him. He has the vision and the concept and the passion but he always misses the mark. It’s like he ALMOST does it, but then doesn’t. With exception to Cabin Fever – that movie rocked. Never seen it. Would I like it? Hmmm, I doubt it lol.